Architects and interior designers have been relying on 3D modeling software and house design applications for many years. Now, app developers are bringing the same kind of apps to iOS, allowing anyone to design and remodel their house without spending hundreds of dollars on professional software. 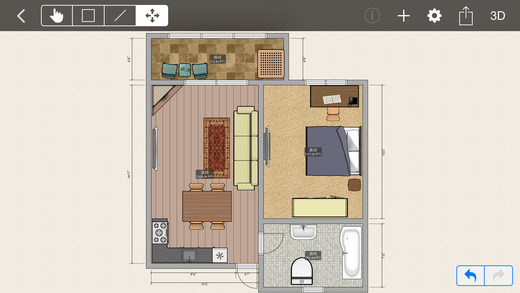 With the apps featured on this list, you can create detailed 2D floor plans, visualize rooms in 3D, add decorative items, and even see how individual pieces of furniture would look like in your house using augmented reality. Available on iOS and Android, Roomle contains a large database of realistic 3D models of furniture from USM Haller Living, Vitra, HAY, and Ikea. All 3D models are customizable and can be easily placed into several demo 3D floor plans. If you can’t find a demo plan that corresponds to the layout of your house, you can draw a new one from scratch using your fingertips. Those who demand greater precision can take advantage of Roomble’s planning service. Starting it 25 euros per plan, a professional designer working for Roomble set up interactive Roomle floorplans based on images or scanned floorplans. With just a few taps on the screen, you can place furniture in your room and see how it would look like in real life using the app’s augmented reality feature. Even if you’re someone who’s taste in home decoration is questionable, seeing furniture and decorative fixtures as if they really were in your room makes it easy to decide what looks good and what doesn’t. It takes months and even years to become proficient in 3D modeling. Unsurprisingly, people who master the craft charge big money for their services. For people who just want to see how their remodeled house will look like before they hire contractors and begin tearing down walls and disassembling furniture, an easy to use iOS house design app is a much better choice than hiring someone for the job. Home Design 3D is an intuitive modeling app that’s suitable even for complete beginners. You can use it to draw floorplans, design and decorate both the interior and outdoor of your home using thousands of pieces of furniture and accessories, and render everything in 3D. The app is available for free, but you need to purchase an upgrade via in-app purchase to save your projects. Saved projects can then be shared online or transferred to other devices thanks to the cross-platform combability. House Design is the simplest 3D house modeling app on this list. It can be incredibly useful whenever you want to buy a new piece of furniture but are unsure whether you have enough space for it. Using over 300 items and materials, you can put together a rough visualization of your apartment or house to see how everything would fit. 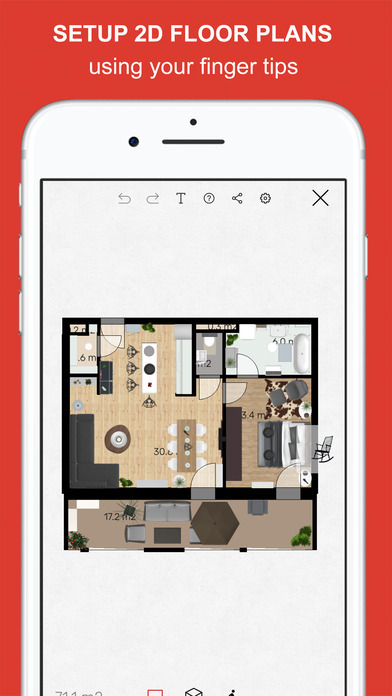 The app can automatically compute the size of your room thanks to an intelligent room recognition algorithm, and it allows you to export your projects as images. The free version does everything the paid version can do, except for saving. roOomy takes furniture shopping and interior decoration to the next level. The app can convert existing photos of your room into 3D spaces, which you can then fill with what could be the largest selection of 3D home décor items and furniture of all the apps on this list. Companies and apps like Houzz, Amazon, Wayfair, Crate & Barrel, West Elm, Target, Havert’s, and others have provided detailed models of tables, chairs, beds, floors, curtains, and much more. All models are customizable, including colors, fabrics, and patterns. To inspire you, roOomy also features virtual stagings with actual purchasable home furnishings in 3D. 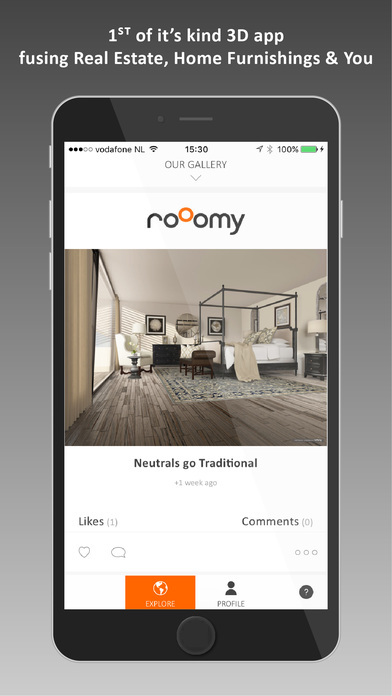 Property owners can use roOomy to showcase their properties in the best possible light, filled with beautiful furniture instead of showing uninspiring empty rooms with white walls. With the Matterport 3D Showcase app for iOS, you can view realistic 3D spaces in fully immersive 3D. Real estate agents are already using Matterport to create virtual tours that tell buyers what a property looks like as if they were exploring it in person. Anyone else can use the app for inspiration and fun.